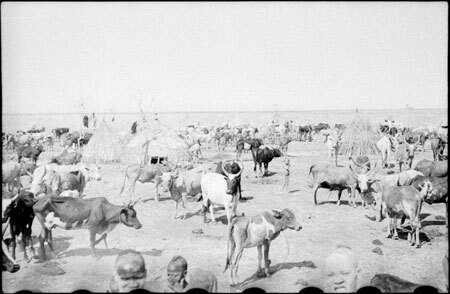 A Nuer cattle camp, with small roughly made grass sleeping huts and cattle visible. This camp, made by youths who move with the cattle to better water sites during the dry season, was probably encountered by Thesiger during his first trek in Western Nuerland in January 1938. From the elevated vantage point, the image may have been taken from horseback or from a mound. Several impressive wer oxen with upcurving horns can be seen. Morton, Chris. "Nuer cattle camp" Southern Sudan Project (in development). 03 Jan. 2006. Pitt Rivers Museum. <http://southernsudan.prm.ox.ac.uk/details/2004.130.32836.1/>.